A high quality, triple plastic pulley in parallel, on a steel frame, with hooks at each end carrying three plastic pulleys each of diameter 50 mm. 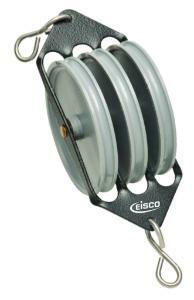 Inner gap of pulley measures 4 mm, overall length is 8.9 cm. Capable of holding over 30 lbs of weight.